This tricky hand-game became known as rock-paper-scissors and under several other names, variations and combinations. But which role does fortune really play in this captivating game? If you like it or not: At the latest by the time a child starts primary school, it will be introduced to the entertaining game rock-paper-scissors. It is usually played by two people who form one of the three symbols with an outstretched hand on cue. With the last word of the game (rock-paper-scissors) both players reveal their chosen gesture. Each symbol can win or lose against another one. 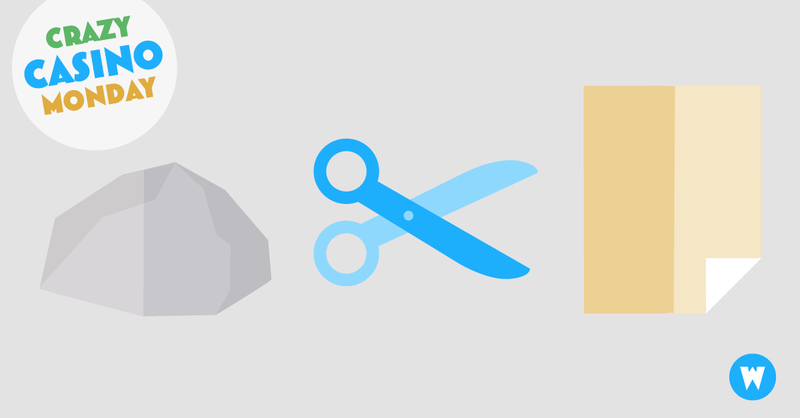 Rock crushes scissors, scissors cuts paper and paper covers rock. If both players choose the same shape, the game is tied and has to be repeated. In the end, the player with the highest number of victories wins the game. Nowadays, rock-paper-scissors is known across the world and is often used as a fair choosing method between two people, similar to flipping a coin. The game is assumed to originate from the Japanese “sansukumi-ken” games from the 17th century, which were played by using both hands. A single-handed version named “jan-ken” with similar gestures to today’s rock-paper-scissors has probably reached Europe in the 19th century. In the middle of the 19th century, the Rock Paper Scissors Association was established in London and moved to Toronto in 1918. Already seven years later, the club counted more than 10,000 members. The annual world championship takes place in Toronto since 2002. One could assume that the victorious player of rock-paper-scissors wins by chance, similar to other games of chance. However, psychological effects lead to irrational decisions. Humans are guided by emotions and choose the gestures not always just by chance. Players often tend to use the same pattern after a won round. The US-American psychologist Edward Lee Thorndike explained this reaction at the beginning of the 20th century with the so-called "Law of Effects". Accordingly, people tend to repeat actions if they are rewarded in advance. At Wunderino you’ll find classic games of chance, a live casino and exciting tournaments. In addition, our online casino gives you a fascinating insight into the world of poker, blackjack, roulette, slots and other addictive table games. On the way you can earn your money with our Wunderino app and thanks to PayPal you never lose track of your winnings and bets. Of course, bonuses and regular free spins are also waiting for you. Test your luck and prove your talent!